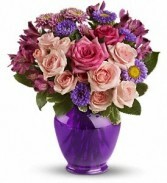 Secret Jewels Charmers* Scented Candle in Whitesboro, NY - KOWALSKI FLOWERS INC.
A great way to say "I'm thinking of you". 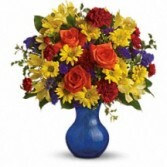 Blue vase is filled with lilies, carnations, accented with assorted fillers. A lovely gift for any occasion! Pamper someone special with fragrant bath and body products in the scent of Tuscan Honey or Camille. Special orders are no problem, we can create one to fill with your choice of items. Store hours may vary sometimes. Please call ahead for information on store hours.